NPQ has repeatedly suggested that large universities need to play nicer with others when it comes to providing for the health and well-being of surrounding communities. This story exemplifies the kind of behavior that can stoke resentment. 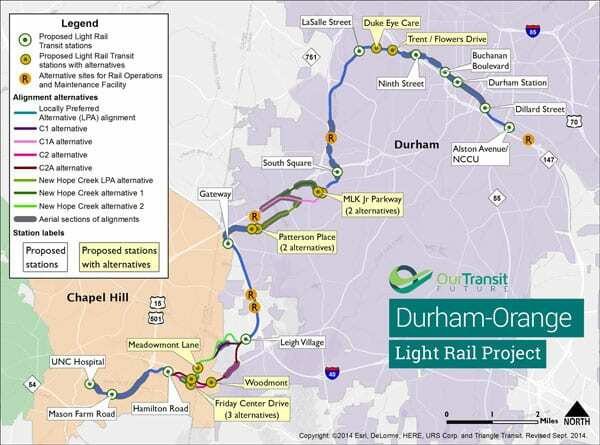 In the Triangle Park region of North Carolina, a 17.7-mile light rail line that “could combat gridlock by linking Durham and Chapel Hill, home to the University of North Carolina, and would provide access to three major hospitals as well as the historically black North Carolina Central University in Durham” seemed to be moving full speed ahead, with taxpayers in both Durham and Orange counties voting in favor of assessing a sales tax to pay for it—until Duke University put on the brakes. Duke officials are adamant that their objections to the project are serious and insurmountable. They said construction vibration and electromagnetic interference from the trains might affect sensitive research equipment at Duke’s sprawling medical campus, which the train line would skirt. And they are concerned about the project’s impact on the underground utilities that serve the medical center—and the threat of new lawsuits. Fausset adds, “Duke officials have said they are not opposed to light rail in general, only to this specific project.” In short, the threat of construction vibration and electromagnetic interference made them do it. On its face, Duke’s reasoning sounds plausible—but a little bit of history makes Duke’s argument seem more dubious. To understand, one should look at another university that raised the same argument nine years ago. Shortly afterward, however, the very same school became a leading advocate for what is now known in metro Washington as the Purple Line. Had a new non-vibrating technology been invented? Hardly. What had changed was the university’s leadership. Daniel Mote stepped down and Wallace Loh took his place. Given that similar technical issues have been managed successfully by so many other communities, what are Duke’s true motives? In the Times, Fausset acknowledges that “some critics wondered whether Duke was using its stated concerns as an excuse for other, hidden worries about the train.” For instance, the Duke statement mentions “public safety”—often coded wording for fears that transit might bring low-income people of color into wealthier white areas. Certainly, if this were the case, it would not be the first time light rail opposition has been so motivated. Meanwhile, Duke’s action has provoked widespread condemnation. Wib Gulley, a former mayor of Durham, likened Duke’s decision to reject light rail to its 1969 decision to call in the police “to gas and beat students” amid civil rights protests.